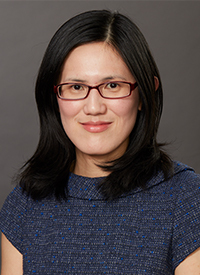 Ming-Hsuan Wu has a Ph.D. in Educational Linguistics from the University of Pennsylvania. Her research and teaching focus on critically engaging educators to recognize and build upon English language learners’ multilingual abilities and lived experiences. She has specialized in the following substantive areas: bilingual/biliteracy education, ESL/EFL teacher education, culturally relevant pedagogy, urban education, language policy and planning, and heritage language education. Dr. Wu has extensive experience of working with immigrant students, their families, and their teachers in public schools. Her approach to TESOL has always been about highlighting students’ and educators’ agentive roles in advancing their educational surroundings. She has published on topics ranging from material development, language maintenance to critical language pedagogy. Before joining Adelphi, she was Assistant Professor in the TESOL/Bilingual Programs at Touro College where she also directed the NYSED grant program, Clinically Rich Intensive Teacher Institute (CR-ITI) for TESOL and Bilingual Education. She currently directs two CR-ITI oprogram at Adelphi University. Trained as an educational linguist, I am interested in how issues of social class, gender, race/ethnicity, and language are manifested in educational (in)equality and how emancipatory educational practices can be initiated and maintained in urban schools. Broadly speaking, my work examines how both students and teachers from diverse backgrounds navigate the official and hidden curricular spaces of urban schools. I draw on educational research from a critical pedagogy perspective, which situates the historical struggles of people of color in the context of social justice and aims to create social change by engaging minority students in critiquing the current social and linguistic realities in which they are living (Alim, 2007; Luke, 2009). In particular, I seek to understand teachers’ agentive roles in positively impacting immigrant students’ academic and social lives as well as young people’s agentive roles in contesting dominant discourses on diversity. I have published on topics related to culturally responsive pedagogy (CRP) in urban schooling, “Chinese” heritage language maintenance, and interracial/interethnic friendships among diverse students. I continue to examine how the intersections of race, culture, class, and language play out in urban students’ educational experiences in the NYC context, focusing on Chinese American students’ transnational experiences. Immigrant families living in large cities in North America often send their young children back to their country of origin and bring them back when the children reach school age. This practice may transpire for various reasons, including lack of childcare in the host country, low wages among immigrant parents, or intergenerational childcare as a norm back home. Media coverage and current research on these children have highlighted their difficult emotional, linguistic and social adjustment upon returning to North America. Some social psychologists argue that the decision to send young children back to the parents’ country of origin cannot be understood in the traditional Western understanding of parenting and urge more research on this population’s experiences. I am currently conducting a qualitative research project with Dr. Sonna Opstad from Touro College at an elementary school in Brooklyn to better understand how teachers understand their transnational children's bicultural, bilingual, and transnational experiences. The project seeks not only to reveal the challenges these students face in the classroom, but also their resilience and the linguistic and social resources that they bring to the classroom. This study is an international collaboration among professors in Taiwan and the U.S. to examine the experiences of Asian Americans who teach English in Taiwan. In a broader context where English is marketed as a desirable product for consumption worldwide, hiring young English speakers as language teachers and de facto cultural ambassadors of the U.S. is a common practice in some East Asian countries (Motha & Lin, 2014). Specifically, this research project investigates the racialized experiences of Asian American English language teachers in Taiwan and their strategies in managing and negotiating their linguistic and cultural competencies. Dr. Genevieve Leung from the University of San Francisco, Dr. Ivy Haoyin Hsieh from Tamkang University in Taiwan, Jhih-Kai Yang from the University of Taipei, Kelly Xiuwen Lin from Fulbright Taiwan, and I explore the degree to which race and language are conflated in the TEFL profession and how these identity politics play a role in the classroom and in the local communities. We hypothesize that these Asian American teachers will have both negative and positive experiences with their Asian American identities and strategies in leveraging their professional and personal competencies. Our manuscrip is currently under review. Wu, M.-H., & Leung, G. (2015).Contemporary Chinese American language maintenance: Perspectives of youth and young adults in Philadelphia and San Francisco. Chinese America: History & Perspective, 69-74. Wu, M.-H. (2014). Innovative education for diverse students in a changing era: One U.S. urban school’s alternative teaching and learning. International Journal of Multicultural Education, 16(2), 36-55. Wu, M.-H., & Leung, G. (2014). Re-envisioning heritage language education: A study of middle school students learning Mandarin Chinese. Heritage Language Journal, 11(3), 207-223. Wu, M.-H., & Leung, G. (2014). Language and identity. In M. Y. Danico (ed. ), Asian American Society: An Encyclopedia. Thousand Oaks: Sage. Wu, M.-H., Lee, K., & Leung, G. (2014). Heritage language education and investment among Asian American middle schoolers: Insights from a charter school. Language and Education, 28(1), 19-33. Leung, G., & Wu, M.-H. (2012). Linguistic landscape and heritage language literacy education: A case study of linguistic rescaling in Philadelphia Chinatown. Written Language and Literacy, 15(1), 114-140. Wu, M.-H. (2011). Language planning and policy in Taiwan: Past, present, and future. Language problems and language planning, 35(1), 15-34. 2019-2023 Clinically Rich Intensive Teacher Institute in TESOL & Bilingual Education. New York State Education Department Grant. 2014-2017 Clinically Rich Intensive Teacher Institute in TESOL & Bilingual Education.